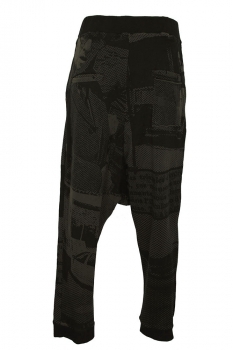 Rundholz Black Label Collection stretch jersey, print trousers in 'mocca allover' print colour. Deep, doubled, black fabric, ribbed, elasticated waistband. Pull-on style. Low crotch. Faux-fly with placket. 2 side pockets and 2 rear pockets with added detail. 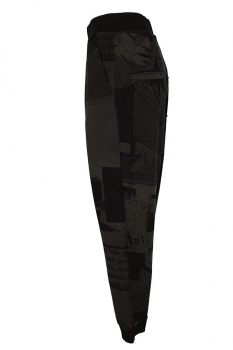 Doubled, black fabric, ribbed, elasticated hems. Lovely print.